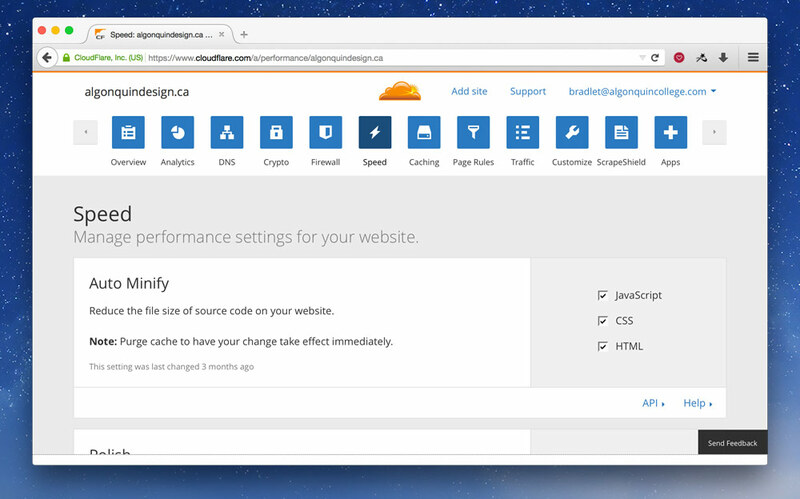 Performance is one of the most important constraints of web design. 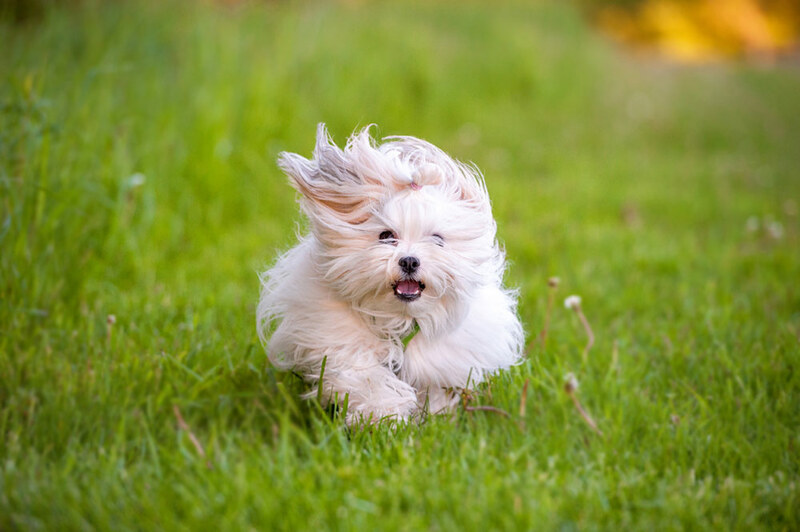 There’s lots extra we can do to make our websites super fast and therefore our users super happy. There’s a whole lot you can do to make your website faster before getting to these steps. ☛ Make sure you follow all the steps in the basic performance tutorial first. For images we always start by choosing the correct format, compressing as best we can, and running through ImageOptim. But there’s more we can do. And for other website resources we can increase performance with just a little care. PNG-24 – millions of colours. When exporting our PNGs from Photoshop we always choose PNG-24 because Photoshop’s PNG-8 implementation isn’t correct, lacking 8-bit transparency. But, PNG-8 has lots of performance gains because it can make much smaller file sizes with it’s limited colour palette. There’s another tool called ImageAlpha that allows us to take our PNG-24 graphics and convert them to PNG-8, reducing their colour palette but keeping nice transparency. Open up ImageAlpha and drag and drop your PNG into its window. Using the slider on the left, reduce the number of colours until the image doesn’t become distorted. Try to make the colours number as small as possible without destroying the integrity of the image. After you’re finished you have to re-save the image over top, so go to the menu and go to File > Save As… and just overwrite your original PNG. Check “Optimize with ImageOptim” to get an extra size reduction. With the image you’re seeing above the size reduction was pretty great, with no noticeable loss of quality. One way to significantly decrease the size of JPG files is to blur the sections that aren’t the focus. Literally take the blur tool in Photoshop and significantly blur out the background of the image. This is the original JPG—136 KB. This one has a blurred background—102 KB. Since favicons are automatically requested on every website there’s a few things you can do to increase their performance. Make sure it exists — the browser will automatically request it, so if it doesn’t exist there will still be a delay while attempting to fetch it. Smush the PNGs first — before creating the final .ico file make sure to run you favicon PNGs through ImageOptim. 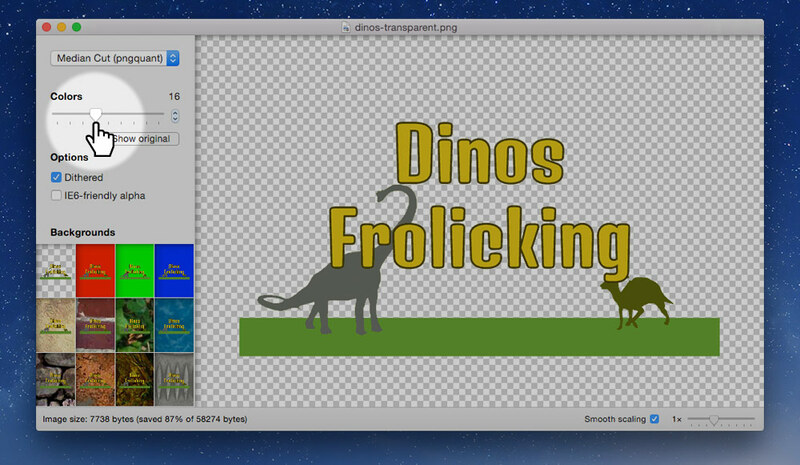 And ideally you should be able to run them through ImageAlpha to compress the images even further. If an SVG image is used only once on your website, on a single page, consider embedding it directly into the HTML. See the advanced SVG tutorial on how to embed SVGs in HTML. Most typefaces come with many characters so they can support lots of different languages. But, depending on the site you’re making you may only need a few of those characters. For example, if your website is only in English you can remove a bunch of characters from the font file. Removing characters from the font file is called sub-setting. Google Fonts provides a limited sub-setting of their typefaces, but you can download the fonts and run them through another system to truly reduce the file size. 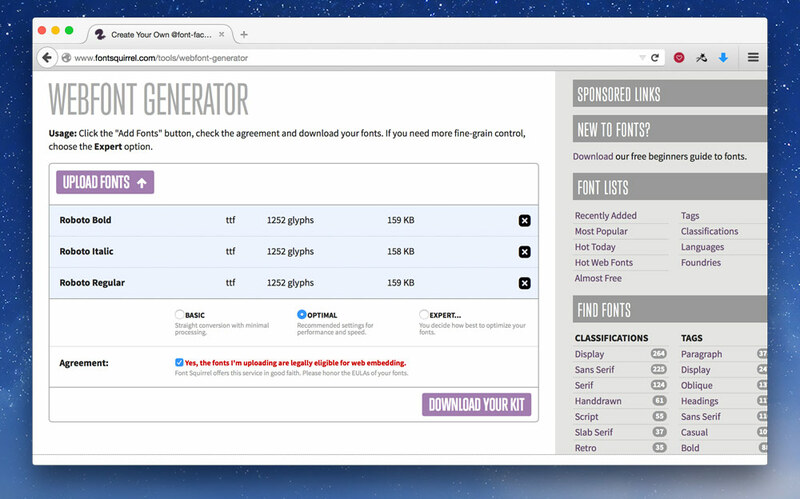 Go to FontSquirrel’s Web Font Generator and upload the styles and weights of the fonts you’re planning on using. The “Optimal” setting is likely what you need. I usually go with “Expert…” and only choose “WOFF” for the font formats because, according to Can I Use, it has good enough browser support—custom fonts are a luxury, not a must have. After you’ve downloaded the font package, put the font files in your website, maybe a folder named fonts—or ideally on a CDN. Then copy the CSS from the CSS file into the top of your CSS—you may have to update the font paths at the top of the CSS you copied-and-pasted. Roboto Regular: 163 KB to 26 KB. Roboto Italic: 161 KB to 30 KB. Roboto Bold: 162 KB to 26 KB. For really small graphics it makes more sense to embed them directly into your CSS or HTML instead of forcing the browser to open another request and download the file. These are called Data URIs. Data URIs are great for small PNGs, like icons, and also work really well for small SVGs. With this in your CSS, the browser will encounter the background-image line then go and download the icon.png file. Even though the icon is really small the overhead of having to open another connection to the server and initiate the download takes time. But, using a tool like DataURL.net, we can convert the icon to text and embed it into our CSS file. Be careful with data URIs, because they can make the image file size larger, the saving with data URIs is there isn’t another request—so stick to small images only. The whole thing is surrounded in double quotes (“). But the SVG inside, is in single quotes (‘) — most tools will output those as double quotes. All greater than symbols (>) are replaced with %3E. All less than symbols (<) are replaced with %3C. All hashes (#) are replaced with %23. I generally don’t do this manually, but use a tool like Gulp. Read more about command-line tools below. First, try remove all the duplicate code and try to merge your CSS into common components. After doing that we can reduce the size of our code even more, a process called minification. It’s like smushing images, but for code. It removes all the extra characters, all the white space, all the tabs—everything that’s helpful for humans and unnecessary for computers. Resulting in a smaller file size. Concatenation is just a fancy word for combining. Here’s an idea of what CSS will look like before and after minification. The computer can’t tell the difference between the two pieces of code, and it saves us a lot in download time. Notice how the variables and functions have been renamed and simplified. After your files have been minified it’s convention to append the .min extension onto them. Never delete the original source file. Always keep the original and the minified versions. Minification is a process that shouldn’t be done by hand, but should be automated by a tool. There are lost of different tools, manual & automatic, GUI & command line. Many of these tools will even automatically minify when you save your file. Choose the one that works best for you. Some popular GUI tools are Prepros & CodeKit. Command-line tools are extremely popular (and this is how I do it). They have many advantages over GUI tools but are slightly more complicated to get running. Some of the popular command-line tools are Gulp & Grunt. The tools are really just task runners, they delegate to other pieces of code to do the minification and concatenation. For CSS a popular minifier is clean-css or cssnano. For JS the most widely used minifier is UglifyJS. These minifiers can be run without a task runner, but it’s a much less manual if you use something like Gulp. ☛ Watch a video on concatenating CSS with Jekyll. Go to the “Speed” section and check all the options in “Auto Minify̦”. Not only is it extremely important to make our code and resources, like images, download really quickly, but the server we host our website can have a big impact too. When using GitHub as a host, you’ll have to hook up CloudFlare to get the best compression. For the Apache web server, check out the configuration provided by HTML5 Boilerplate. For the Nginx web server, also check out the configuration provided by HTML5 Boilerplate. There’s more configurations in the repository too. Another thing you want to set up on your server is proper caching headers. The idea behind caching headers is that they encourage the user’s browser to save a copy of your website on the local computer. You can choose how long the local copy should be kept. When using GitHub as a host, you have no control over this, so hooking up CloudFlare is a great solution. Check the server configurations above for setting this up on other web servers. If you’re using CloudFlare you can set up the proper compression and caching headings really easily. In fact the compression is already on. At the very top set the “Caching Level” to “Standard”. Scroll down a little and set the “Browser Cache Expiration̦” to something high, like “1 month”. You may as well turn on “Always Online” while you’re at it. Content delivery networks (CDNs) allow us to distribute our resources around the world on lots of different servers. Then when a user downloads our website they receive the file from the server that’s closest to them making it download more quickly. Most often we put our static files on CDNs, primarily images, because they’re the files that most benefit from CDNs. Using a CDN when hosting on GitHub is really helpful because Git/GitHub do not support large files. Things like fonts, large images, videos, etc. should all go onto a CDN instead of in your repository. 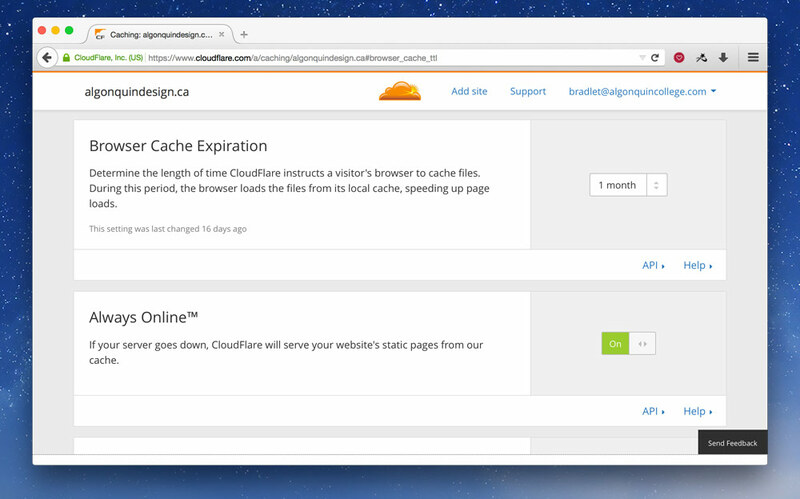 CloudFlare is a very popular CDN with lots of great free features. But not only do they provide CDN features—automatically—they also perform other performance tasks: like minification, caching headers, gzipping and more. After CloudFlare becomes our DNS provider these features are fairly automatic after the set up. They even provide a bunch of security features like DDOS protection and free HTTPS for websites. If you’re hosting on GitHub you’ll have to use a ☛ custom domain in order to take advantage of CloudFlare. Also not that if you’re hosting on GitHub the HTTPS isn’t true: the connection between your user and CloudFlare is encrypted, but the connection between CloudFlare and GitHub is not. This is just a limitation of GitHub hosting right now. ☛ See how to set up CloudFlare as your DNS provider. KeyCDN is another very popular CDN. They are a little more traditional than CloudFlare: they only provide resource hosting, not all the other compression & security features. With KeyCDN we can either upload our large files to them or host the files on our server and KeyCDN will pull them onto their servers and distribute them around the world. ☛ See how to use KeyCDN to host large video files. One major killer of performance on your website is third-party scripts, like advertisements and trackers, that you can’t completely control. Be sure to test any ad services and tracking systems you use on your website to make sure they don’t completely destroy the performance. Even though the download time of our website is one of the biggest contributers to slow websites we can also help the browser render our website more quickly. The time it takes for our website to become visible on the screen is really important, we want to try to avoid white screens and unstyled text as much as possible. Fonts can impede rendering with an effect called “Flash of Invisible Text”. FOIT is when the website background colours and CSS design renders but there is absolutely no text on the page. After at least a few hundred milliseconds the text pops into the design. FOIT makes the website feel like it’s loading more slowly—it technically isn’t—but the time to screen is longer. This is a choice that browsers have made when rendering websites: choosing to hide the text until the font has finished loading. There are a few solutions to this problem, but most importantly make sure your website renders properly without your custom typeface. Most solutions delay the loading of the fonts and show the default web-safe fonts until after the font face loads. After the font face has finished loading we add it to the page, add a class to the page that changes the font to the custom typeface. Next up we write a little script that checks if the font has finished loading. When it has finished loading, then we add a class to the <html> element. If you have more than one font weight or style you’ll need a slightly more advanced script. See the font face observer script for this website with multiple weights and styles. The reason we don’t specify the primary web font on the <html> directly is because it will freeze the display immediately as the browser tries to use it. By putting the web font under a class—that gets added by Font Face Observer—the browser can default to our fallback and only display the web font when it’s ready. It’s important that you find a fallback font that closely matches your web font is height, weight, etc. To take it even a step further we can request that the browser download our fonts ahead of time to encourge a quicker rendering by using <link> tag in the <head>. There are lots of great features of fonts that we can use on the web but each new feature has some performance issues. Consider how important these features are before implementing them. hyphens — causes rendering lag because the browser has to calculate where all the hyphens should be and re-layout the content—every time the page loads or screen resizes. text-rendering: optimizeLegibility — adds a bunch of features like ligatures and hyphens to your text but currently has abysmal performance on browsers, so be very careful. Many performance advocates—especially Google—really push for inlining critical CSS. The idea is to figure out the CSS that is used to display the content that’s visible on the screen before scrolling, then take that CSS and put it into <style> tags. This isn’t something you really want to do manually, but something you should leave up to tools—something like Critical in combination with Gulp. You can see inline CSS in action on my website. Nothing is worse than a website that doesn’t scroll smoothly, aka a janky website. position: fixed & background-attachment: fixed can have major performance issues causing the browser to re-render the whole page every time you scroll. CSS effects: text-shadow, box-shadow and especially filter. Parallax is almost always janky, there is so much changing on the screen every time you scroll browsers have a difficult time keeping up. There is a fairly new CSS property called will-change, it can help with a few of these issues. Sara Soueidan & Chris Ruppel both have great articles on will-change. Since the web is a big place with many different devices, there’s lots of devices that have slower processors, less memory to render websites—and batteries. Nobody wants their battery to be drained by a sucky website. Oversized images — large images, much bigger than the device, cause memory problems because they need to be shrunk down to display on the screen, but are still too big for the device. Data URIs — can cause processor lag because they have to be decompressed and re-generated into their original format. Lots of unnecessary downloads, trackers, etc. — the more you use the network on the device the more battery is consumed, the more memory is used, etc. Be careful. CSS Triggers… A game of layout, paint, and composite.